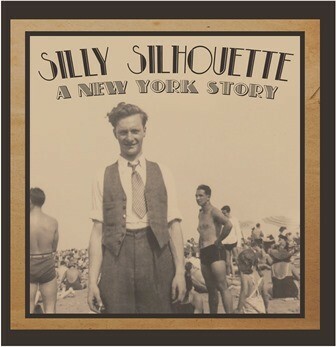 "Silly Silhouette: A New York Story - the Songs of Louis Rubin" featuring: Liane Carroll and Ian Shaw with Alice Zawadzki, Brendan Reilly and Karl Charity with James McMillan (trumpet), Roger Carey (bass) and Russell Field (drums). “​Silly​ ​Silhouette”,​ Rubin’s best known song, ​was​ ​performed​ ​on​ ​the​ ​American​ ​TV talent​ ​show​ ​“Songs​ ​for​ ​Sale”​ ​in​ ​1951​ ​by​ ​Rosemary​ ​Clooney​ ​and​ ​the​ ​Ray​ ​Block Orchestra,​ ​when​ ​Lou​is ​appeared​ ​as​ ​a​ ​double​ ​act with his wife Beatrice. Louis​ ​Rubin​ ​was​ ​born​ ​1920​ ​in​ ​Brooklyn,​ ​New​ ​York,​ ​the​ ​son​ ​of​ ​Russian​ ​immigrants who ​lived​ ​in​ ​a​ ​tiny​ ​apartment​ ​with​ ​eight​ ​siblings.​ By​ ​the​ ​age​ ​of​ ​16​ ​he​ ​was​ ​writing​ ​songs and​ ​jingles​ ​and​ ​sending​ ​them​ ​to​ ​any​ ​publisher​ ​he​ ​could​ ​find. He​ ​wrote​ ​more​ ​than​ ​200​ ​songs​, many ​during​ ​World​ ​War​ ​II​. He​ ​married​ ​the​ ​subject​ ​of​ ​his​ ​many​ ​love​ ​songs, Beatrice,​ ​in​ ​1941. A​ ​year later​ ​he​ ​was​ ​drafted​ ​into​ ​the​ ​US​ ​Army​ ​and​ ​was​ ​shipped​ ​to​ ​the​ ​UK,​ ​leaving​ ​behind​ ​a two​ ​month​ ​old​ ​baby to became ​a​ ​GI, ​based​ ​at​ ​​ ​Warrington​ ​in​ ​north-​west​ ​England. After​ ​three​ ​years​ ​away​ ​from​ ​his​ ​family,​ ​he​ ​returned​ ​home​ ​with​ ​his​ ​passion​ ​for song writing​ ​undiminished. Rubin​ ​died​ ​in​ ​1984​ ​at​ ​the​ ​age​ ​of​ ​64.​ ​Thanks​ ​to​ ​his​ ​younger​ ​daughter​ ​Suzan,​ ​who inherited​ ​his​ ​original​ ​sheet​ ​music,​ ​his​ ​songs​ ​have​ ​been​ ​brought​ ​to​ ​life​ ​by​ ​some​ ​of Britain’s​ ​top​ ​jazz​ ​musicians. Liane​ ​Carroll (vocals​ ​and piano) - Award​ ​winning​ ​Liane​ ​has​ ​been​ ​a​ ​pillar​ ​of​ ​the​ ​British​ ​jazz​ ​and​ ​soul​ ​scene​ ​for​ ​decades. MOJO​ ​Magazine​ ​said​ ​of​ ​her​ ​‘Liane​ ​Carroll​ ​doesn't​ ​just​ ​sing​ ​jazz.​ ​She​ ​is​ ​jazz’. Ian​ ​Shaw (vocals) - With​ ​15​ ​studio​ ​albums​ ​under​ ​his​ ​belt,​ ​Ian​ ​has​ ​been​ ​dubbed​ ​one​ ​of​ ​the​ ​world’s​ ​finest male​ ​jazz​ ​vocalists​ ​and​ ​songwriters. Karl​ ​Charity (vocals​ ​and brass) - A​ ​multi-talented​ ​trumpeter​ ​and​ ​vocalist,​ ​Karl​ ​has​ ​played​ ​in​ ​​bands,​ ​musicals and​ ​ensembles,​ both ​in​ ​the​ ​West​ End​ ​and​ ​internationally. Alice​ ​Zawadzki (vocals​ ​and violin) - A​ ​vocalist,​ ​composer​ ​and​ ​classically​ ​trained​ ​violinist,​ ​Alice​ ​was​ ​described​ ​by​ ​Jamie Cullum​ ​as​ ​‘Uncategorisable,​ ​beautiful​ ​–​ ​a​ ​real​ ​force​ ​to​ ​be​ ​reckoned​ ​with’. Brendan​ ​Reilly (vocals) - An​ ​American​ ​singer-songwriter​ ​who​ ​has​ ​toured​ ​the​ ​world​ ​with​ ​artists​ ​such​ ​as Disclosure​ ​and​ ​Basement​ ​Jaxx​ ​and​ ​has worked​ ​with​ ​Florence​ ​and​ ​the​ ​Machine​ ​and​ ​Rita Ora. Roger​ ​Carey (bass​ guitar) - For​ ​more​ ​than​ ​three​ ​decades​ ​Roger​ ​has​ ​played​ ​bass​ ​with​ ​different​ ​bands. He​ ​regularly​ ​performs​ ​with​ ​his​ ​life​ ​and​ ​musical​ ​partner​ ​Liane​ ​Carroll. Russell​ ​Field (drums) - Russell​ ​has​ ​been​ ​playing​ ​the​ ​drums​ ​since​ ​he​ ​was​ ​a​ ​teenager​ ​and​ ​has​ ​performed with​ ​top​ ​artists​ ​including​ ​Midge​ ​Ure,​ ​Barbara​ ​Dixon,​ ​Will​ ​Young​ ​and​ ​Pixie​ ​Lott. James​ ​McMillan (trumpet) -​ ​Four-time​ ​Grammy​ ​nominated,​ ​Brit​ ​award​ ​winning​ McMillian is a record producer and ​engineer as well as a trumpeter.​ ​He has​ ​produced​ ​number​ ​one​ ​hits​ ​in​ ​Jazz,​ ​Classical​ ​and​ ​R&B/Soul​ ​genres. Tell us what you think of Liane Carroll & Ian Shaw "Silly Silhouette: A New York Story - the Songs of Louis Rubin& below..